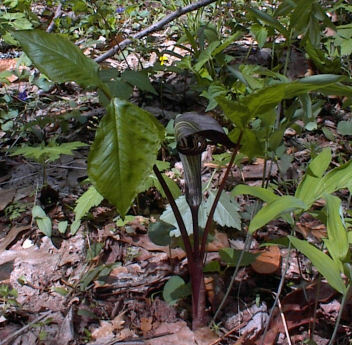 The Jack-in-the-Pulpit is a familiar spring wildflower in most of eastern North America. What is usually treated in the field guides as a single variable species, though, actually consists of at least three separate entities. Arisaema triphyllum "subspecies triphyllum," a tetraploid with 56 chromosomes, is the most common and wide-ranging of these and is found from Quebec to Florida and west to Nebraska, inhabiting moist woodland. "Subspecies stewardsonii," a diploid with 28 chromosomes, is found in bogs and swamps in the northern part of the same range, occurring south as far as the mountains of North Carolina. "Subspecies pusillum," also a diploid with 28 chromosomes, is in more southern moist woodland, ranging from Florida north to Ohio and Pennsylvania. The entity triphyllum has been derived from a hybrid between the other two. The usual series of events that results in speciation of this type is that two species occasionally cross-pollinate to produce sterile hybrids. As the result of an unlikely genetic accident one or a few of these hybrids develop with twice the usual number of chromosomes and turn out to be fertile, since each set of parental chromosomes has a compatible set. The fertile plants become a new species and go on to evolve on their own. DNA analysis could probably tell us whether this happened more than once in the evolution of A. triphyllum. 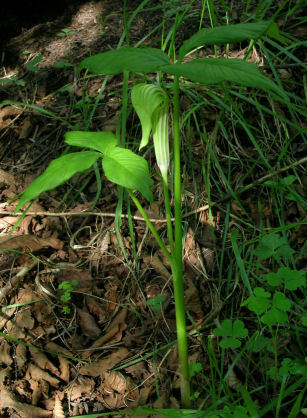 The best study of the group, Miklos Treiber's Biosystematics of the Arisaema triphyllum Complex¹, demonstrates clearly through field and breeding studies that the three "subspecies" are reproductively isolated (ie do not interbreed with each other to any significant degree) and behave as separate species in nature. Nevertheless, he concludes that they are best treated as subspecies of a single, variable species. This point of view seems to be based mostly on the fact that it is difficult to distinguish the entities using pressed herbarium specimens. We believe that this is not a good reason for not recognizing three good species, and, as Edgar Wherry remarks in The Genus Phox², "When multiple taxa get relegated to 'synonomy' ... their very existence is likely to be overlooked." The Flora of North America gives a taxonomic key to distinguish A. triphyllum, A. pusillum, and A. stewardsonii. All three have the same basic arrangement of a single stem bearing one or two compound leaves with a single inflorescence on the stem at the base of the leaf or between the leaves. 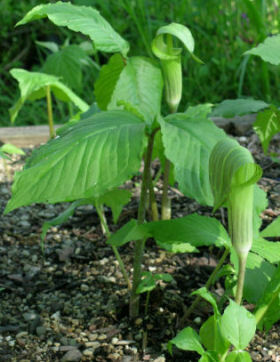 Arisaema triphyllum is generally more robust. The foliage is usually glaucous (silvery green) below. 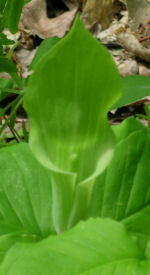 The spathe (the cone-shaped "pulpit") is contrastingly striped white and green and often with purple-brown and is not vertically ridged. There is a relatively wide, slightly rolled flange on the horizontal edges of the spathe. The spadix ("jack") is club-shaped, thicker near the top than in the middle. Arisaema pusillum is generally a little smaller. The foliage is green below. The spathe is striped only subtly, and the flange is less wide and less rolled. 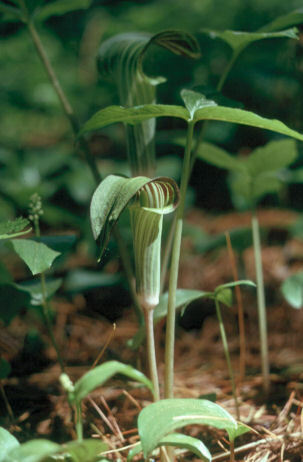 The spadix is cylindrical or slightly more slender at the top. Where populations are mixed, A. pusillum is usually in wetter areas at the bottom of the slope, A. triphyllum up on the slopes. 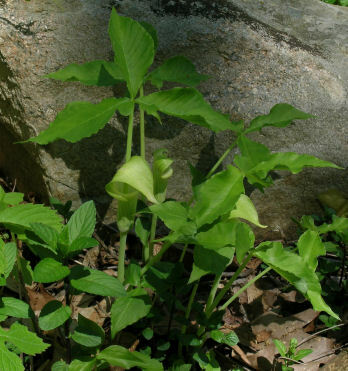 Arisaema stewardsonii is also a little smaller and with foliage that is green below. The spathe is heavily ridged, so much so that the overhanging hood cannot be reflexed to expose its inside without damaging it. The side flanges of the spathe are narrow and not rolled. The spadix is cylindrical. A. triphyllum varies greatly in overall size and in coloration. We have found mature plants that are as tall as 75cm (30in) and as short as 30cm (12in). The inflorescences are about the same size, so small plants have inflorescences that are larger in proportion. The spathe may be all green (f. viride), far left, slightly shaded with purple, heavily striped with purple (f. zebrina), or even heavily shaded with purple on the outside. 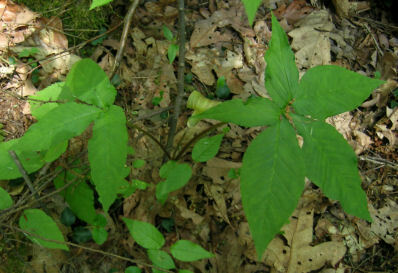 The stems may be shaded or spotted with purple. The inside of the spathe of Arisaema triphyllum may be beautifully striped with white or green-white and purple or even solidly blotched with purple. The spadix can be almost black. The proportions of the spathe hood vary from rounded to lanceolate when reflexed. In our area occasional plants bear leaves with the two lateral leaflets deeply lobed or with five fully separated leaflets. We have seen these in Ohiopyle State Park, Fayette Co., PA; Cathedral State Park, Preston Co., WV; and Blackwater Falls State Park, Tucker Co., WV. We do not know what the relationship of these forms is to A. triphyllum ssp quinatum, a taxon with five leaflets found in the southern US. In Arisaema pusillum the inside of the spathe is often marked with purple, but not in the contrastingly striped manner of A. triphyllum. If the spadix is purple, it is only at the top. Arisaema stewardsonii has the spathe heavily ridged in white, with the top of the spathe enclosing the opening more tightly. The plants we have seen have the inside of the spathe contrastingly striped in white and purple and the spadix shaded with purple. Arisaema are members of the family Araceae, which includes familiar cultivated plants such as Calla and Caladium. These plants have an obvious spike of small flowers above a large colorful bract. 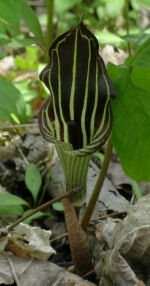 In Arisaema the bract is enlarged into the spathe, which encloses and hides the flowers. 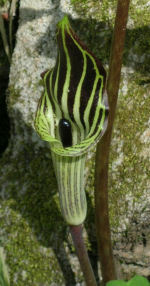 The flowers are borne on the lower part of the spadix, with a wide ring of female flowers below a ring of male flowers. Usually only one type of flower actually develops in any season, with smaller plants producing staminate (male) flowers and larger ones pistillate (female) flowers. 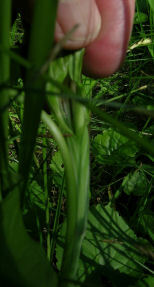 The plant overwinters as a corm with a smooth, rounded bottom and a pointed bud on top. Growth and bloom of A. triphyllum and A. pusillum occur just after the end of killing frosts in the spring, in our area the last week of April to mid May. A. stewardsonii blooms a couple of weeks later than A. triphyllum where they are found together. 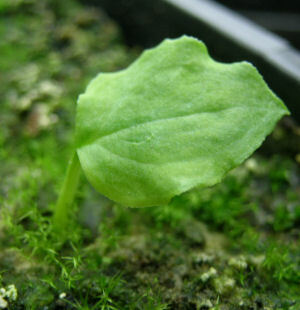 A. triphyllum grown from seed collected in different localities often differ by several weeks in emergence and bloom date. The plants are pollinated by small flies. Since corms also produce offsets that may grow flush with the mother corm and then eventually separate or at the end of runners, a population may contain individuals of the same clone that are both functionally male and female. This system results in outcrossing between individuals but they are not necessarily genetically different individuals. Fertilized female flowers develop into a cluster of berries that are green at first and then turn bright red by the end of summer. The bloom stalks of plants that have borne staminate flowers wither by early summer, but the sturdier stalks of fruiting plants often last into winter. Presumably the fruits are eaten by birds, which excrete the cleaned seeds. Arisaema triphyllum and A. pusillum are easily grown in moist, humusy, near neutral soil in light shade. We have not yet grown A. stewardsonii in our garden; it may require moister, more acid soil. The pH of the Canaan Valley site mentioned above is 4.88. A. triphyllum and A. pusillum will increase in the garden by corm offsets. To grow them from seed, we gather the berry clusters in the fall and keep them moist placed on pots of soil in a cold greenhouse until late winter. By late February we clean the seed by crushing the berries gently in a sieve under running water. The cleaned, dried seed is then sown buried to several times its diameter in a commercial seed mix. Germination begins in March. 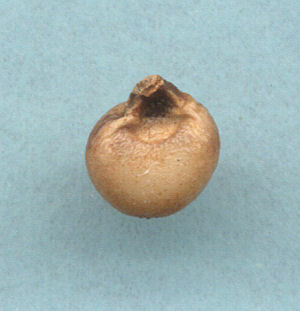 The seeds resemble tiny corms (below). First year seedlings have single leaves (below right). Second year plants will have larger single leaves or three leaflets, depending on how well the plants have grown. Bloom will occur in another two years or so. As far as we know there are only two named forms, both selections of A. triphyllum. "Mrs. French's Veined Form" is a seed strain of a viride type (ie no purple coloration) with the leaf veins greenish-white. This was found by Nicholas Nickou in the garden of Mrs. French. This is available from Seneca Hill Perennials. 'Black Jack' is a vegetatively propagated cultivar that was found wild in Florida. This is a zebrina form with the foliage suffused with purple. This is available from several sources including Plant Delights Nursery, linked under the form name. ¹ Treiber, M., 1980. 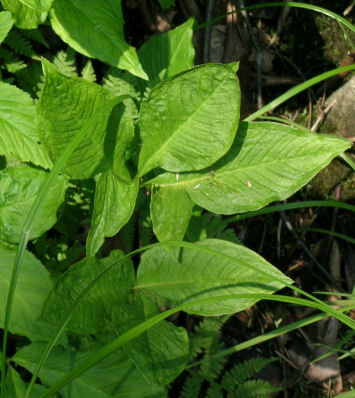 Biosystematics of the Arisaema triphyllum Complex. PhD Dissertation, University of North Carolina, Chapel Hill. ² Wherry, E. T. 1955. The Genus Phlox. Morris Arboretum Monographs III. Phila., PA. This page is a work in progress and will be updated occasionally with new observations and photos.